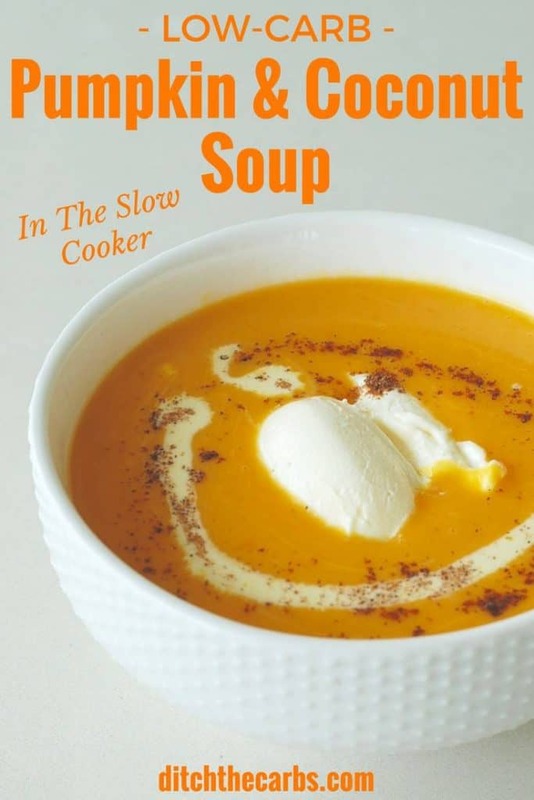 Low-Carb Pumpkin And Coconut Soup - all in the slow cooker - genius! 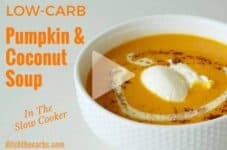 Did you know just how easy it is to make low-carb pumpkin and coconut soup? Throw it all together in the morning, and it will be ready and waiting for you when you step in the door tonight. 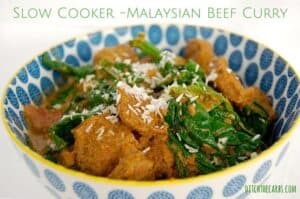 And to make this recipe Paleo or vegan, simply omit the butter and replace with extra coconut cream. If I had to give you my number one tip, of all time, to be successful in living low carb, I would advise you learn to love your slow cooker. You can prepare all your chopped ingredients in the morning, throw them all together and turn it on. When you walk in the door, your delicious healthy dinner will be waiting for you. If you are really organised, you can even prepare any slow cooker recipe the night before, directly into the slow cooker dish. Keep the dish in the fridge covered, then just pop it into the slow cooker and turn on. Heck, you could even prepare any vegetables too and leave them in saucepans covered, ready to cook. Low-carb pumpkin and coconut soup comes in at just under 10g net carbs, but there are ways you can make it lower carb (remember tinned/canned varieties may be up to 29g carbs per 250ml serving size). How about adding more low carb veggies such as cauliflower? Maybe dilute it further with the addition of extra vegetable stock, water or coconut cream? The soup is incredibly thick and creamy, so with most low-carb dishes, you wont be wanting much before you start to feel full. Low-carb pumpkin and coconut soup is the perfect winter warmer. Freeze extra in muffin tins and pop into ziplock bags for individual portions to thaw and re-heat. Place all the ingredients into the slow cooker dish. Mix. Cook on HIGH for 4-6 hours OR Cook on LOW for 6-8 hours. Puree until smooth using a stick/immersion blender using the bald attachment. Keep warm until ready to serve. The recipe makes a large, heavy, thick soup. 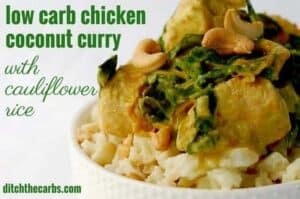 To make this lower carb, you can add more liquid to dilute the soup, add more low carb vegetables such as cauliflower, or serve as a side dish. I love throwing everything in the slow cooker when I know I won't be home until late and I need dinner ready and waiting. Alternatively, cook on the stove top for 30 - 45 minutes. Hi. I am on Keto diet. My question is, how is the carbs and sugar so high? Great question. There are 9.9g net carbs for one serving, mainly from the pumpkin. 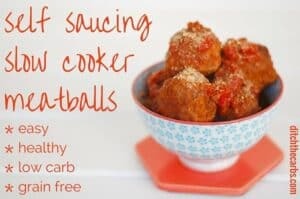 This is a low-carb recipe, not a keto recipe so yes is higher than a keto daily allowance would probably allow. Coconut cream is generally 25% fat, whereas coconut milk can be anywhere between 5-15% fat. Here is a page I wrote showing you the varieties I use. Hope this helps. Amazing soup but the quantity seems tiny. It is meant to serve 6 but only feeds 2! Unless it is just an entree rather than a stand-alone soup? I made a double quantity and filled my large slow cooker to the top!!! 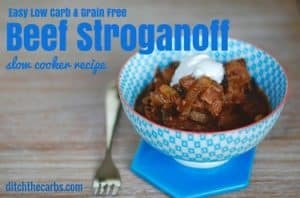 Could this recipe be converted for Instant Pot? I’m sure it could be, unfortunately I don’t have an Instant Pot yet so can’t advise on how. But I’m sure this would be perfect for the Instant Post. 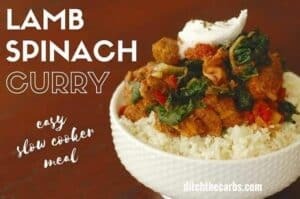 is an instant pot the same as a thermomix Libby? 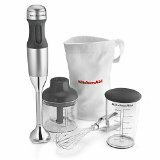 A thermomix is about 10x the cost of an Instant Pot, it works differently and has a blade which also slices and chops. An Instant Pot sautés, slow cooks, pressure cooks and steams. I have just bought an Instant Pot so will be experimenting with new recipes using that in the coming months. If I used canned pumpkin how much would I need? 500 g converts to 2.2 cups,. A small can is 15 oz. A litt over 2 cans or one big can, depending on siz abailable. Would using chicken or beef broth majorly change the taste of this soup? I need to up my protein (doctor’s orders) and I’m hoping to sneak it in instead of the vegetable broth. That would be lovely addition to the soup. I didn’t add broth to this recipe only because I wanted to give recipes that my vegetarian readers could enjoy. Serve with some mini cheese loaves, that would be a perfect meal. BUT – why cook for 5! hours? Alternatively, cook on the stove top for 30 – 45 minutes. Hi Libby, I mare a variant of this b4 seeing your recipe. I used 1 tsp of Keens Curry powder, instead if the onion, ginger and garlic. It was delicious – everyone loved it. Since I last posted several months ago, I have lost 19 kg (I cheat – good for 5 days, then I eat toast …. have lost NOTHING in over 2 months, but not.giving.up) and my 17 year old son has lost over 40kg and is looking slim and fit. While we haven’t eaten fat head pizza in ages, THAT was the recipe that convinced him he could do this. That there was always a substitute that would satisfy you enough to stay on track. Your recipies helped me help him. You are a godsend and you are helping people regain their health and their lives. You have helped a gorgeous young man see a much happier future for himself and I am so very grateful. I made this soup for the first time today. The flavour is different but really great, unlike any other pumpkin soup I’ve made before, but both my husband and I loved it. I think it’s the combination of coconut, ginger and pumpkin flavours which makes for the wonderful aromas and taste. It is very easy, so will definitely be a recipe I make again over the cooler months. I also love the slow cooker, so anymore recipes for this would be fantastic. I have arthritis in my hands. Can I use canned organic pumpkin in this? Thank you! Yes you can. Pour it into muffin trays and place in the freezer. Once frozen, pop them into zip lock bags and you have individual mug sized portions ready to reheat. I leave the skin on the pumpkin to increase taste and fibre and lower carbs. Once i blitz it in Thermomix cant see the skin. Adds nice flavour. Do you think you could use butternut squash instead of pupkin? Yes, that would work really well too. Butternut squash or pumpkin higher in sugar and carbs I think. 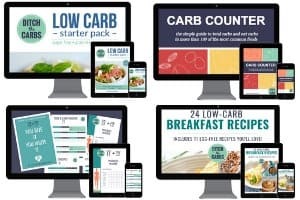 I just started the low carb diet through your company and I have lost 4 pounds in 6 days. I also exercise couple hours daily. I was have a diff time losing the menapause weight I put on over the last 5 years. Nothing worked until now. Thank you!!! I’ve loved the cabbage and hamburgers. And the hamburger taco seasoning too. I love soups will try the pumpkin and coconut. Can you suggest an alternative for dairy. 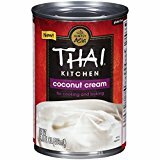 Can I use unsweetened coconut milk or almond milk? I made this the other day and put in some cooked chicken….so good! Thank you so much for all of your great recipes and great tips. Love viewing your recipes on video… thanks.